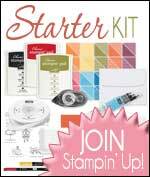 Do you wish you had even more money to spend on Stampin' Up! products? Consider it done! Place a workshop or customer order that comes to £250 (or more) - and Stampin' Up! 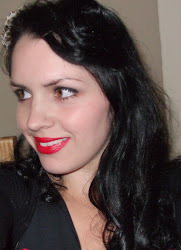 will give you an extra bonus £25 of Hostess Pounds to add to the regular Hostess Pounds you earn. So, a £250 order would mean £65 Hostess Pounds FREE to spend on whatever you like in the catalogue. A £300 order would mean £75 free Hostess Pounds (instead of the usual £50), and so on. Contact me now to order, or to book up your home party. During this time you'll get an extra £25 in your Starter Kit if you sign up to be a Demonstrator. That's £155 worth of Stampin' Up! products for only £99 !! You customise your kit by choosing whatever you fancy. 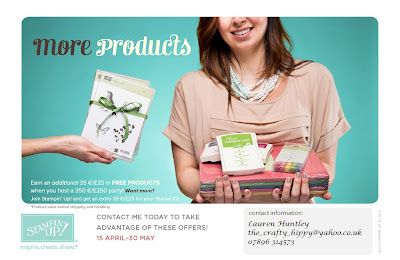 Plus you get a free Business Pack (catalogues, invites, order forms etc) worth over £45. So that's a lot of Stampin' Up! goodness for only £99. There are many benefits to being a demonstrator - please have a look here for more information, or simply get in touch with any questions you may have. As you know the Annual Catalogue is retiring in a couple of months ready for the spankingly-beautiful new one on the 1st of July - and with the new catalogue we will see our wood-mount stamps packaged differently. This means they will file away neatly next to the clear-mount stamps; which already feature the name of the stamp set and pictures down the side of the box. LOTS of exciting news from Stampin' Up! at the moment, please keep coming back to get all the information you need.